Death of a Cure by Steven H. Jackson: Synopsis and Online Purchase Options. Synopsis (from the publisher): They are the keepers of our hope. They are better, we need them to be. They battle daily in the fight to find a cure for our loved ones. But is the dream of a cure really their mission? Have they come to see the disease, our enemy, as their benefactor? How far would they go to protect the enemy? Would they kill? 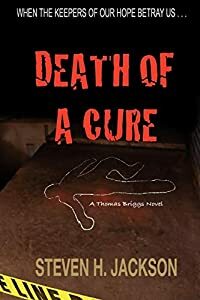 Death of a Cure is a novel of mystery, suspense and action. The murder of one good man by a respected colleague is more than a crushing personal deception, it is an unequaled violation of the trust of millions afflicted by a horrible disease. The brother of the murdered man, a military surgeon born to wealth and accustomed to success, is thrust into the role of homicide investigator. Discovering that his skills as a detective are insufficient, he calls upon a woman from his past for help. Together they unravel layers of evil and deception revealing that the work of this healthcare charity has little to do with curing the terrible disease born by a trusting constituency.